Howard Virgil Dickey was born Nov 14, 1918 in Minneapolis, Minnesota, just three days after the Armistice that ended "The War to End All Wars". He grew up there in Minneapolis, graduating from North High School. 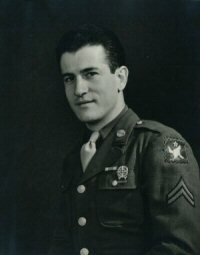 When WWII broke out for the US in 1941, he was a newlywed, having married Helen Kufel in September of that year. He decided to voluntarily enlist in the Air Force at Fort Snelling on October 9, 1942 and was given a delayed entry until his first son was born on November 6. 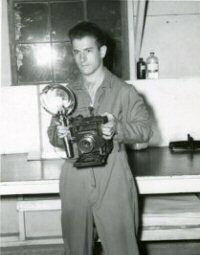 Howard had an interest in photography and was sent to the Army's photo school at Lowry Field, Colorado. From there, he was assigned to the 39th Bomb Group in the 61st Squadron as a Camera Technician, joining them in Salina, Kansas as they trained for their eventual deployment. Trying to delay their inevitable and unknown separation, Helen joined them there with their young son, subletting a room from a friendly family in town for 3 months. Eventually it was time to ship out and Howard went with the 39th to North Field, Guam in January 1945. Helen also served, working for a short time at the New Brighton (MN) Arsenal that made small caliber ammunition for the Army. For the Group's time in the Pacific, Sgt Dickey maintained the equipment, installed cameras into the airplanes and developed and forwarded the critical payload upon their return. He would be happy to see that several of his pictures are included in the 39th Bomb Group website. After demobilizing, Howard returned to Minnesota and spent the remainder of his professional life at the Minnegasco Gas Company, initially doing service work but primarily spending time in their research laboratories. He enjoyed the social aspects of his local VFW post. Howard and Helen retired to Alamogordo, New Mexico where they enjoyed light traveling and learning about Native American cultures. Together they raised 3 sons and a daughter, two of whom served in the military as did two of their four grandchildren. Howard took his final flight on May 23, 1988 and is buried at the Fort Bliss National Cemetery in El Paso, Texas. Helen joined him there on Thanksgiving Day, 2008.